Interesting encounter between a team of winning tradition such as San Antonio Spurs who is in the low places in the west conference table and Philadephia 76ers positioned 4th place in the east conference table. Redick scores the first 2 points of the match, Gay in penetration overturns the ball to diminish the advantage, Simmons turns and converts a big basket near the paint, DeRozan converts a good medium distance basket, then Simmons responds again with another excellent basket, it looked like a duel between Simmons and DeRozan, then Bertans converts a shot from the perimeter, Korkmaz scores an effective shot from the perimeter, finishes the first quarter 32 - 29 up 76ers. 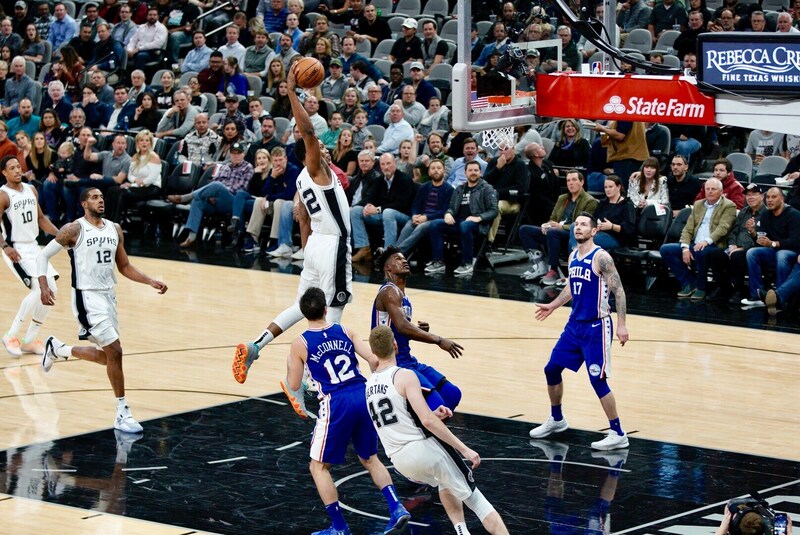 Embiid's offensive rebound and converts the basket, Bertans scores from the perimeter, Alridge converts a hook into the paint, Gay scores a good basket Spurs would go up, Chandler scores 3 points, White converts a basket into penetration and Spurs would continue to take advantage in the game, Gay scores a mid-distance shot, Redick responds with 2 penetration points, Gay in penetration capsizes the ball spectacularly, 3 more points scores Bertans, finishes the first half 49 - 60 up Spurs. Embiid assists Simmons and the overturn, Alridge responds with 2 points, Gay scores a great shot from the middle distance, Forbes scores and gives a comfortable advantage to Spurs of 17 pts. Gay scores from the middle distance and Spurs continues to increase its solid advantage of 20 pts. Mills scores a shot from the perimeter, Muscala responds with a 3 point shot, Gay would respond with a new shot from the perimeter and Spurs' very wide advantage was 28 Pts. 76ers would be playing one of his worst encounters, Shamet scores a 3 point shot and then Muscala would find another shot from the perimeter, Kormaz scores on an offensive rebound, finishes fourth 71 - 93 up Spurs. Belinelli scores a 3 point shot, Butler scores in penetration but Spurs' lead was still wide, there were 7 minutes left in the game and the teams were already playing with their benches for Spurs' wide lead of 28 Pts. The 96 -123 match ends with a resounding victory for San Antonio Spurs. A match that was dominated from start to finish by the San Antonio Spurs where the Philadelphia 76ers were totally apathetic and had no reaction whatsoever, I thought the game was going to be more competitive but I was surprised by this overwhelming defeat that Spurs gives 76ers, through the Spurs' good offensive and defensive efficiency. LaMarcus Alridge 20 Pts. 10 Reb. Rudy Gay 21 Pts. 6 Reb. DeMar DeRozan 20 Pts. 6 Reb. Leave me your impressions if you read the publication or enjoyed the game.